*All terms that are in BOLD are defined at the Definition section located at the end of this document. The Service(s) are made available to you by Maxis, subject to this General Terms & Conditions ("GTC"). This GTC replaces and substitutes all previous terms and conditions you have with Maxis. Any specific Service(s) you use are subject to the GTC as amended and/or supplemented by the applicable Service Specific Terms & Conditions ("SSTCs"). Upon Activation of the Service(s), you are deemed to have accepted and be bound by this GTC, Summary Terms & Conditions, SSTCs, Maxis Fair Usage Policy and such other terms and conditions as we may impose from time to time and the Agreement shall be in force from Activation of the Service(s) and continue unless terminated in accordance with the Agreement. To be eligible for the Service(s), you must be at least 12 years old. You must provide your registration details prior to using the Service(s), which includes your name, address and identification documents (i.e. National Registration Identification Card (NRIC) or passport) and such other details as may be required by us. We may decline supply of the Service(s)to you based on reasons including your eligibility for the Service(s) based on the SSTCs, the availability of the Service(s) and your compliance with our registration requirements. If we decline supply of the Service(s) to you because the Service(s) are not available in your area, your registration details will be kept in our records pending availability of the Service(s) in your area. You must use the Service(s)in accordance with the Agreement and ensure any person you allow to use the Service(s) complies with the Agreement. You are fully responsible for use of the Service(s)and/or Content disseminated through your account(s), whether by you or by any third party. You are to ensure at all times that your Mobile Device, SIM Cardand Mobile Number are lawfully owned/ used/ possessed in compliance with all laws or regulations of Malaysia. and take all reasonable steps to prevent spamming, fraudulent, defamatory, offensive, improper, immoral and indecent actions or illegal use of the Service(s). We will deduct from your Account, an amount equal to the value of the Service(s)accessed by you from time to time at rates stipulated on our website, in our user guide and/or as may be imposed by us from time to time. other than allowed under the Service(s), you will not use, copy, disseminate or provide any information or Contentor any parts or derivatives thereof (whether in its original or adapted form) received as part of the Service(s), for purposes of creation of any commercial products whether tradable or otherwise. We may, at our discretion, refuse or remove access to any Content, products or services which you transmit, make available, access, use or acquire via the Service(s),including those which may or are alleged to contravene the laws of Malaysia, improper, defamatory, offensive, indecent, objectionable or illegal or infringe any party's intellectual property rights. We have no warranty as to the accuracy, reliability and quality of any Contentobtained through the Service(s). cause any disruption, interference, interruption or degradation in the Networkor the Service(s). Where user identification is necessary to access the Service(s), you must use the requisite user identification. You must ensure the security and secrecy of your login identification, passwords, PINor email or other accounts given to, chosen by or owned by you. You must ensure that these are not revealed to any third party as you are fully responsible for all activities that occur thereunder, whether or not such activities were carried out with your express consent and/or knowledge or otherwise. We may refuse, change or remove login identification, password(s) or PINwhich we deem inappropriate. If you discover or suspect any unauthorised use or disclosure of your login identification, password(s) and/or PINor that your account security has been compromised, you must immediately inform us and change your password(s) and/or PIN. You are advised to change your password(s), PINor any other security identification regularly and to set up security of computers and any servers that may run on the computers to protect your own security. The security of your account, Equipment, network and systems, including any Contentstored, sent or received through these mediums, is your own responsibility. You agree that we cannot guarantee and will not be liable for and we disclaim any and all liabilities with regard to any transmission, information or Content through the Service(s) or our Network. You agree that we will not be held liable or responsible in any way for any prohibited and/or unauthorised use of the Service(s). You must report immediately to us (within 24 hours) upon the discovery of any fraud, theft, loss, unauthorised usage or any other occurrence of unlawful acts in relation to your Mobile Phone, Mobile Device, Mobile Numberor SIM Card and its use in respect of the Service(s). You agree to lodge and provide us a certified copy of a police report, if needed. You will remain responsible for all transactions and access using the Accountand/or Log-on Detail by any third party whether authorised by you or not, until the report is formally made to us. We are not responsible in any way for and do not endorse any third party products and/or products. We and the operator of the visited foreign telecommunication services network shall not be liable for any loss or damage which you may sustain from or through the suspension/ termination/interruption/loss of or inability to use the international roaming Service(s) due to any cause whatsoever. When using the international roaming Service(s), you shall be subject to all terms and conditions of the Agreementand such other terms and conditions as we deem fit as imposed from time to time including in respect of Charges. The Maxis Group Privacy Statement will form an integral part of this GTC. You confirm and agree that you are aware and give your consent to Maxisto process your Personal Data as defined under the Personal Data Protection Act 2010 and that your Personal Data will be used and/ or disclosed in accordance with the Personal Data Protection Act 2010 and the Maxis Group Privacy Statement at http://www.maxis.com.my/en/privacy-statement.html. Maxis may update the Maxis Group Privacy Statement from time to time. By continuing to use the Service(s) and/or products after such changes, you are deemed to have accepted and/or consented to and/or to be bound by such revisions and/or modification of the Maxis Group Privacy Statement. We are entitled to make any alteration or changes to the Service(s) in whole, or any part thereof, or withdraw or suspend, disconnect or terminate the Service(s)or any part thereof and we will not be liable to you or any third party for any loss (including loss of revenue), loss of Service(s) or connectivity or inconvenience as a result thereof. Where reasonably practicable, we will endeavour to give you advance notice of such changes, be it through written notice, electronic mail, our bill, our website or such other form as we deem appropriate. We are entitled at our discretion, from time to time, to vary, add to, remove or otherwise amend the terms and conditions of the Agreementor any part thereof. The prevailing terms and conditions of the Agreement and the Service(s) will be updated on our official website, whereby the terms and conditions on the official website will apply and supersede all previous versions. Any variations, additions or amendments will take effect on the date the variations, additions or amendments is posted on our official website, also termed as "Effective Date". Your continued use of the Service(s) after the Effective Date of any changes to the terms and conditions of Service(s) and/or Agreement will constitute unconditional acceptance by you of such variations, additions or amendments and you will be bound by the same. In the event you do not accept such changes as per Clause 5.2 above, you will cease to use our Service(s). We may at our discretion with prior notice vary the amount of any applicable fees and any Charges for the Service(s)or part thereof. Please make regular checks on our official website for any changes in the Agreement. We scan our documents for purposes of data security, further security measure for prevention of loss documents, for efficient and better document management. You agree that all such scanned documents including the Registration Form, Agreement, and/or other applicable documents, are relevant and admissible in evidence. We may extract any Short Message Service details, Personal Dataor any other data from your account as evidence in court and/or when necessary if there is suspected and/or proven misuse of the Service(s). We are entitled to manage your allocated bandwidth including without limitation reducing your speed or suspending your bandwidth to the Service(s)to ensure fair access to all Maxis customers on the same network with or without prior notice to you as prescribed in the Maxis Fair Usage Policy. We may carry out any of the rights under Clauses 5.1, 5.2, 5.3, 5.4, 5.5, 5.6 and 5.7 above in any manner deemed appropriate by us and we will not be liable to you or any third party for any loss or inconvenience for the same. Where Service(s) are provided on a free trial basis, you agree that upon expiry of the free trial period as per our Agreement, the full Chargesfor that Service(s) will apply. You agree that display of the applicable Charges for the Service(s) on our official website or applications will constitute notice of the Charges. If your subscription for Service(s)is made pursuant to a promotional package, you agree that all additional terms and conditions applicable to that package will apply. We reserve the rights to withdraw without liability any promotional package at any time without assigning reasons. Where the promotional package involves a third party, you must also comply with all requirements imposed by that third party and we may take any action to protect their interests. MOBILE NUMBER PORTABILITY (MNP) – What you need to know about Mobile Number Portability. we may, upon receipt of a Port request, send you a validation SMS to confirm the Portingout process, wherein your failure to respond to the validation SMS may result in a Port request being rejected by us. You are allowed to Portfrom prepaid to postpaid Service(s) and vice versa. However, you agree and accept that all Porting requests are subject to our terms and conditions for new registration. You confirm and agree that all your services associated with the MobileNumber provided by the Donor Network Operator ("DNO"), including value added services, rate plans, charges and fees will be terminated when the SIM Card of the DNO is deactivated upon your successful Porting to the Recipient Network Operator ("RNO") and Activation of Maxis' SIM Card. You acknowledge and accept that for Porting of a prepaid Mobile Number, any balance of credit you had with the DNO will be forfeited. We will not be liable or responsible to you or any third party claiming through you for such forfeiture of any balance of credit and any loss or damage whether direct, indirect, special or consequential, or for loss of business, revenue or profits or of any nature suffered by you, or any other person, or any injury caused to or suffered by a person or damage to property by reason of termination of the DNO SIM Card and services associated with the Mobile Number provided by the DNO. You consent, confirm and agree that your request to Portyour Mobile Number is a notice to terminate your subscription with the DNO. We will not be responsible or liable for any unsuccessful or failure to Port to us. You will be responsible to fully settle all outstanding bills from the DNO. If there is non-payment by you of all outstanding bills from the DNO, the Service(s)with us may be disrupted. Credits and/or any balance of credits in your Accountare not redeemable for cash. We will provide you a SIM Card with an alternate Mobile Number that you can use for the Service(s) pending approval of your Porting Upon activation of the Service(s) with this alternate Mobile Number, we will proceed with your Porting request. Provision of these Service(s)and the Agreement's terms and conditions will be effective upon activation of the alternate Mobile Number by us. Should your Porting request be approved by the DNO, we will map your Porting Mobile Number to the SIM with the alternate Mobile Number. If your Porting request is rejected by the DNO, we will not map your Porting Mobile Number and your use of the Service(s) will continue with the alternate Mobile Number. You agree, as a Maxisprepaid customer, upon Service Migration to Maxis postpaid Service(s), you have the option of continuing with the value added services you previously subscribed to as a Maxis prepaid customer, if available under the Maxis postpaid Service(s). upon successful Service Migration, you shall not be allowed to migrate back to your original plan until the completion of an entire billing cycle (if applicable). The MobileNumberand SIM Card will remain Maxis' property at all times and the property of the Mobile Number does not at any time pass to you. We grant you the right to use the Mobile Number and SIM Card for purposes of your usage of the Service(s). We may revoke the Mobile Number where the Service(s) is terminated or where you are in breach of any terms and conditions of the Agreement, unless the number has been Ported. The Service(s)and/or features to be provided under the SIMCard will depend on the type of Mobile Equipment, Mobile Phone or Mobile Device used by you. You must register and obtain our prior approval if you intend to obtain a second or further SIMCard. You must pay all fees and Charges required for the new subscription. The Agreement will apply with respect to the additional SIM Card. You agree to be fully responsible for usage of the SIM Cardand usage Chargesincurred including the use by any other person whether or not authorized by you. Maxismay reallocate, withdraw or change such Mobile Numberas a result of applicable law or instructions from the relevant authorities, but will endeavour to take reasonable steps to prevent disruption. You must use all precautions to prevent loss, theft, and cloning and/or unauthorised use of the SIM Card. If any of these things happen, you will immediately notify us of the same and you shall remain liable for all Chargesincurred by use of the SIM Card, Mobile Numberand/or Mobile Device. Replacement of a SIM Card is subject to payments as may be prescribed by us. any act or omission by you or any unauthorised use or exploitation of the Service(s). You will not acquire any right in any and all our Intellectual Property. We may sell or otherwise provide you Softwareor you may access Software via the Service(s). You shall, by your use and/or possession of such Software, be deemed to agree not to copy, reproduce, make available, translate, adapt or modify the Software in any way. The Service(s) are provided on an "AS IS" and "AS AVAILABLE" basis and you expressly confirm and agree that your use of the Service(s)and your reliance on any Contentobtained through the Service(s) at your sole risk. as to performance of any equipment or materials supplied in connection with the provision of the Service(s). Notwithstanding anything to the contrary herein contained, Maxis and our respective Personnel and/or suppliers will not be liable to you or any other party in contract or tort (including negligence) or otherwise in respect of any claim brought by you or any third party for any loss of profit or revenue or loss of business or loss of data or for interrupted or suspended communications or for any direct, indirect, special, incidental, consequential damages, punitive damages or for any injury caused or suffered by a person or damage to property or any damages arising out of or in connection with the Service(s)or the Agreement, whether or not Maxis, our Personnel or suppliers were or should have been aware of the possibility that such damage or loss would occur. The exclusion referred to herein applies to any action giving rise to an obligation, duty or liability. We disclaim any and all liability to the fullest extent allowed by law. any claim for libel, slander, infringement of any intellectual property rights arising from the transmission and receipt of material in connection with the Service(s) and any claims arising out of any act or omission by you in relation to the Service(s)or any part thereof. any loss or damage caused to you as a result of the suspension/barring/termination, interruption or loss of the Agreementand/or the Service(s) or any part thereof from any cause. any loss, distortion or corruption of data arising from the use of the Service(s)to transmit data or for data communication purposes including any unlawful or unauthorised access to your transmission or data. Without prejudice to the foregoing, where a court, an arbitrator or tribunal holds or finds us liable to you for any breach or default by us, you agree that the amount of damages payable by us to you will not at any time exceed the sum of RM500.00. where you have relocated or have been relocated to an area outside our Service(s)coverage area. We will try to resume the Service(s)as soon as possible if suspension or disconnection occurs for the reasons set out in Clause 15.1(a) and (b) above. During the period of interruption, suspension or loss of the Service(s)or any part thereof for any reason, you will remain liable for any applicable Charges. In respect of applicable Service(s), we are entitled to restrict access to the Service(s), suspend or terminate your Accountif you consistently use the Service(s)to download or upload extremely high volume data. The Service(s) is not designed for extremely heavy users, e.g. peer-to-peer applications or use of applications that may or will have a detrimental effect on our Network's performance and/or other customer's use of the Service(s). We will not be liable for delay or failure to perform our obligations under the Agreementcaused by Matters Beyond Our Reasonable Control. We may terminate the Agreement, by giving you fourteen (14) days' written notice if the Matters Beyond Our Reasonable Controlprevents us from performing and/or continuing our obligations for more than a period of sixty (60) days. You are not permitted to assign or novate any, or any part, of your rights and/or obligations under the Agreementto any party, without our prior written consent. You agree and consent that we may assign any, or any part, or all, of our rights under the Agreementto our Related Corporationsor any third party by notice in writing to you. You further agree and consent that we may novate any, or any part, or all, of our rights and/or obligations under the Agreement, or the Agreementitself, to our Related Corporations or any third party by notice in writing to you. Your continued usage, after service of such notice on you, of the Service(s)will be deemed as your consent to continue with the Service(s) after such novation, and you agree to make all subsequent payments as instructed in such or any further notice. Each party bears its own costs in terms of any costs incurred in relation to preparation and legal review of the Agreement. You are to bear all government taxes, levies and other costs imposed by law in relation to the provision of the Service(s) by us. If GSTis applicable to Service(s) provided to you under the Agreement, we are entitled to charge the GST payable to the government on the Service(s) supplied to you. provide a tax invoice as may be required by you. If any monies due under the Agreementby you to us is to be recovered through any process of law or if the said monies or any part thereof is placed with solicitors, you will pay (in addition to the said monies) our solicitors' fees and any other fees or expenses incurred or may be determined by the court of law. All communications and documents to be given by you to Maxisunder the Agreement must be in writing and sent to the following address: Maxis Mobile Services Sdn Bhd or Maxis Broadband Sdn Bhd (as may be applicable), Level 21, Menara Maxis, Kuala Lumpur City Centre, off Jalan Ampang, 50088 Kuala Lumpur. published in national daily newspapers in the main languages circulated generally throughout Malaysia. Pursuant to the Maxis Group Privacy Statement, you have given us your consent to receive from us and our merchants, and/or strategic partners, from time to time, any offer and/or marketing/promotional information or notices (be it by way of letter, leaflet, pamphlet, electronic mail, phone messages or any other means of communication) relating to any of our Service(s), products and/or Equipmentand that of our merchants and/or strategic partners, unless you notify us otherwise. The Agreementwill be governed by and construed in accordance with the laws of Malaysia. Parties agree to submit to the exclusive jurisdiction of the Malaysian courts. A right created under the Agreementmay not be waived except in writing signed by the party granting the waiver. No delay or omission by either party to exercise any right under the Agreement will impair such right or be construed as a waiver thereof. A waiver by any party of any of the obligations to be performed by the other party or any breach thereof will not be construed to be a waiver of any succeeding breach thereto or of any other obligation. In the event of a conflict or inconsistency between the Summary Terms & Conditions, GTC, and the applicable SSTCs, such inconsistency will be resolved by giving precedence in the following order: the SSTCs, the GTCand the Summary Terms & Conditions. This Agreementconstitutes the entire agreement between you and Maxisand supersedes all previous agreements, understanding, proposals, representations and warranties relating to the Agreement. Those Clauses which by their nature would survive the termination of the Agreementshall so survive, including without limitation Clauses 2.5, 4, 5.5, 5.6, 10.1, 11, 12, 13, 14.3, 14.4, 14.5, 19.2, 19.3 and 20. Time is of essence in performance of the Agreement. If any provision in the Agreementor the application thereof (other than a term or provision relating to any payment obligation) is held invalid or unenforceable and the remainder of the Agreement not so affected and/or capable of substantial performance will be valid and enforceable to the extent permitted by law. You agree that the Agreementwill be for your benefit only and does not confer any rights or benefits to any third party and that there are no third party beneficiaries associated or connected to you as to this or any part or specific provision of the Agreement. An expression importing a natural person includes any company, partnership, joint venture, association, corporation or other body and any governmental agency. All provisions contained herein will be equally applicable to any and all supplementary lines subscribed by you. Notwithstanding anything to the contrary, you hereby agree to be bound by the Agreement, any policies and procedures and/or any variations, additions or amendments made thereto, as may be determined by Maxisat any time. "Activation" means either the point in time when the Service(s) is activated in Maxis' System. "Active Period" means a period of 30-days upon your successful plan renewal. During this period, customer is able to have access to all services, such as making calls, sending SMS’ and purchasing Service(s) and bundles. "Addendum(s)"means any addendum(s) or supplemental(s) executed and/or deemed accepted by the parties. "Agreement" means the agreement for Service(s) made between Maxis and you in accordance with this GTC, the Registration Form, the Addendums, the SSTCs, the Summary Terms & Conditions, policies and procedures of the particular rate plans or packages and all other documents which are expressly agreed to form part of the Agreement. "Bank" means the banks or financial institutions nominated by Maxis from time to time. "Card" means the debit, credit or charge card (as applicable) nominated by you as payment for the Service(s) and accepted by Maxis. "Cardholder" means the lawful and authorized user of the Card whose name is embossed thereon and whose signature appears on the Card. "Card Issuer(s)" means any bank or legal entity which is the issuer for the Card. "Charges" means all activation, connection, re-connection, disconnection, subscription, usage, installation, relocation, cancellation and administrative charges, advance payments and other fees to be paid by you for or relating to the Service(s) or the Equipment. The Charges will be in accordance with the rates in our prevailing tariff rates available on our official website, or as mutually agreed in writing between you and us, exclusive of all applicable taxes including GST. "Content" means all information, text, sound, music, software, photographs, videos, graphics, data, messages, links or other audio-visual representation, tactile representation, or any combination of the preceding which is capable of being created, manipulated, stored, retrieved, or communicated electronically. “Direct Debit” means the direct debit payment service offered by Maxis whereby your periodic official bill statement may be automatically billed into your Card account for settlement subject to Maxis’ approval or where Maxis is authorised to directly charge your debit/ credit/ charge card (as nominated by you) for on-going recurring payment on a periodic basis. “Donor Network Operator" or "DNO" means a mobile service provider from which a Mobile Number has been or is to be ported out. "Effective Date" Means the date the variations, additions or amendments to the GTC and/or Agreement which are posted on our official website. "Expiry Date" means the date where upon which the Grace Period has ended. "Equipment" means the device, equipment, software and all facilities to be procured, installed and maintained by you at your premises in order to use the Service(s), including without limitation, cabling and wiring which is connected to the Maxis' Network as well as the horizontal cabling from your premises to Maxis' Network, hubs, routers, servers (for networking purposes), compliant and certified modem (if the Equipment is not from Maxis) or any Equipment certified by Maxis to be compliant with the Service(s). "Grace Period" means the period after the expiry date of the Active Period. Such period is subject to change by Maxis. Utilisation of credit, if any, during the grace period is not possible and any outgoing calls, SMS' and internet usages is not possible. Incoming calls and SMS' are allowed during this period. "GST" means goods and services tax. "Intellectual Property" means all copyrights, patents, trademarks, tradenames, logos, service marks and other intellectual property or propriety rights in or related to Maxis, any Service(s), our Network, system or Software or Our Equipment. "Log-on Detail" means the user identification detail and accompanying password supplied to you under the Agreement for access to the Service(s). "Matters Beyond Our Reasonable Control" includes but are not limited to acts of God, insurrection, war, act of terrorism, national or local emergencies, requirements of government or other competent authorities, industrial disputes of any kind, fire, lightning, explosions, flood, inclement weather, subsidence, acts or omissions of third party suppliers, operators, service providers, contractors or agents whom we may use to perform any part of the Service(s), computer software malfunction, electrical power failure and/or interruption or disruption of the Network. "Maxis Fair Usage Policy" means the policy which sets out an acceptable level of conduct between Maxis and its customers using the Service(s). "Maxis Pay" means a payment service offered which enables you to register for and use a Maxis Pay account to make payments or purchase Maxis products and services through your computer, Mobile Device or any other channels in which these services are made available for purchase. "Maxis" or "us" or "we" or "our" means Maxis Mobile Services Sdn Bhd (Co. No. : 73315-V), Maxis Broadband Sdn Bhd (Co. No. : 234053-D) and/or its Related Corporation(s), as may be applicable, and includes their successors, assigns, employees and agents. "Mobile Device" means a wireless device together with accessories for the use of the Service(s). "Mobile Number" means the Mobile Station International Subscriber Directory Number (MSISDN). "Mobile Number Portability"/"MNP" means the ability for customers to change from one mobile service provider to another and retain their Mobile Number. "Mobile Phone" is composed of the Mobile Equipment and SIM Card which facilitates the use of the Service(s). "Network" means network facilities and/or network services comprising of the system or series of system, equipment, software and facilities operated and/or owned by Maxis or through any other network deemed necessary to enable the provision of the Service(s) to you. "Personal Information"/"Personal Data" includes your Information, required for purposes of applying, subscribing and registering for the Service(s) offered to you by Maxis including without limitation the call data records or reports related thereto, including any sensitive personal data and expression of opinion(s) about you. "Port or Porting" means the transfer of your Mobile Number from one mobile service provider to another. "Recipient Network Operator" or "RNO" means a mobile service provider to which a Mobile Number has been or is to be ported in. "Related Corporations" means the related corporations as defined under the Companies Act, 2016. "Service(s)" means any telecommunication services, internet services, broadband services (if applicable), any other services (including, where relevant, cabling, construction and connection service in order for you to have access to the services), products, offers, mobile content services or applications which we provide to you including any plans, packages, the prepaid services and all related value added, supplemental or additional services. "Service Migration" refers to the application by Maxis prepaid customers to migrate to Maxis postpaid Service(s) or vice versa. "Service Provider" means any third party service provider involved in providing the Service(s) to you, including without limitation any network operator or telecommunication service provider. "SIM Card" for GSM Service(s) means either a card or plug-in module with a microchip which contains all necessary information. The SIM Card has to be inserted into the Mobile Equipment and Mobile Phone in order for a call to be made. "SKMM" means the Suruhanjaya Komunikasi dan Multimedia Malaysia (SKMM), also known as Malaysian Communications and Multimedia Commission, established under the Malaysian Communications and Multimedia Commission Act 1998 (CMA 1998). "Software" means any software programmes provided to you as part of or through Our Equipment or Service(s), or which allow you to access or use the Service(s), including any software upgrades or updates. "Starter Kit" means the pack sold by Maxis containing the SIM Card, a user guide and these terms and conditions. "Top Up Ticket" means a prepaid voucher, whether in material form or otherwise, sold by us or any person on our behalf to you which carries unused call credits. "Working Days" means, save for the states of Kedah, Johor, Terengganu and Kelantan, Mondays to Fridays and Saturday (half day) excluding public holidays and Sundays. In relation to the states of Kedah, Terengganu and Kelantan, Saturdays to Wednesdays and Thursday (half day) excluding public holidays and Fridays. "you" or "your" means the individual, sole proprietorship, partnership, company or entity named in our Registration Form whose application for Service(s) or any part thereof has been accepted and approved by us and who uses or intends to use the Service(s) (including his or its successors and permitted assigns) and anyone appearing to us to be acting with any of the said party's authority or permission. "Your/your Information" means any information provided by you to Maxis, including those provided in the Registration Form and/or any of our registration channels for and/or subscription of our Service(s). This Fair Usage Policy ("Policy") sets out an acceptable level of conduct between Maxis and you when using the Service(s). We believe that all users should be responsible in their usage and how it affects other users. To maintain the quality and performance of our Service(s) and to ensure the highest level of service performance for all users - which could be disrupted by usage patterns of a small number of customers - we have established this Policy for the Service(s). This Policy is designed to prevent the abuse of our Service(s). Our Service(s) are for use only in accordance with the General Terms & Conditions ("GTC"), the Summary Terms & Conditions (“STC”) and Service Specific Terms and Conditions ("SSTC") applicable to you. If you need a 1:1 service and exclusive access to your bandwidth, you will need an internet leased line. This Policy is in place with a view to ensure all customers have a good user experience. We may, from time to time, change this Policy, which will be posted on our official website at https://www.ookyo.com.my/ookyotermsandconditions.pdf Please visit our official website regularly to determine any changes to this Policy. Your continued use of the Service(s) after the Effective Date of any revisions/changes to the Policy constitutes unconditional acceptance by you of such revisions/changes and you shall be bound by the same. This Policy supplements the GTC, SSTC and STC for the Service(s). Any repeated, unusual or abusive patterns involving change of rate plans or recurring Mobile Internet passes. They are abuse of change in rate plans or use of Mobile Internet passes; and will be disallowed. In using the Service(s), you must conform to and abide by the laws of Malaysia and not permit any illegal use or such use that will discredit Maxis. Each customer MUST ENSURE that his or her User ID and/or password remain confidential at all times. We may request that you change your User ID and/or password if deemed necessary. You must not disclose your User ID and/or password to any third party, or use the same for any purpose connected with the improper use of the Network including accessing or attempting to access other parts of the Service(s) for which you do not have access rights. You are responsible for taking all reasonable steps necessary to prevent a third party from obtaining access to the Network. You must immediately advise us if you become aware of any violation or suspected violation of the provisions of this Policy. You are responsible for the set-up and security of your computer and or any device and any servers that you may run on your computer or any device. We strongly recommend that you protect your computer and/or device with anti-virus software. You must be at least 18 years old and/or our Business Customer and/or contract staff or employee of a Business Customer to be our customer. Sub-users under this age must have permission from the account holder or from your parent or guardian to access our Service(s). You must not run port-scanning software on any of Our Service(s). You must not attempt to gain unauthorised access to any computer system. You must not undertake any activity that has an adverse effect on our Service(s). You must not use the Service(s) to run programs or servers that provide network content or connectivity to any third party not at the location where the connection is installed. Examples of prohibited programs include, but are not limited to, mail, FTP, HTTP, game, newsgroup, proxy, and IRC servers. You must not resell or otherwise charge others for the use of your internet connection. The Service(s) is for recreational, residential, personal use only and may not be used for operations of an internet service provider unless authorised by us. Office Package customers may host one (1) email (POP3, SMTP, and/or IMAP) and/or one (1) web (HTTP and/or HTTPS) server for the sole use of that organization. These servers may not be used to host other services through the wireless connection or host email or web services for other organizations. Maxis may automatically disconnect your internet session after a period of inactivity, which may vary from 20 minutes to 30 minutes. This automatic disconnection is to allow maximum network performance. In the event that you are in violation of this Policy, we may, at our option and discretion, have your bandwidth managed, Service(s) suspended or terminated (with or without notice as we consider appropriate). If we reconnect your Service(s) at our discretion, a reconnection fee may be charged for us to reactive your Service(s). You must report any illegal, unlawful or unacceptable use of our Service(s). For individual customers, please report to us through our customer service channel on ookyo.com.my or the Ookyo app. This Summary highlights some of the important terms of the Agreement. When you purchase the Service(s), the Agreement in its entirety (and not just this Summary) applies to you. Please read and understand the contents of the Agreement in its entirety. Terms used in this Summary will have the same meaning as defined in the General Terms. In the event of any inconsistency or conflict between the Summary and the General Terms, the General Terms will prevail. We will process your Personal Information pursuant to the Personal Data Protection Act 2010 and the Maxis Group Privacy Statement. These explain your rights to and our usage of your Personal Information. Our Maxis Group Privacy Statement is found on our website at http://www.maxis.com.my/en/privacy-statement.html. for any activity which is likely to cause Network congestion. Our Service(s) may not be available everywhere. Please check Our Network coverage area on our official website at maxis.com.my/network. Whilst we will make every attempt to provide a fault free service, the Service(s) are not fault free as to Matters Beyond Our Reasonable Control. We are not liable to you or any other party, in contract, tort (including negligence), or otherwise for any loss or damage that you may suffer in connection with the Service(s). We will provide you with a tax invoice if GST is applicable. We may suspend or terminate your Service(s) in a number of circumstances, including where you breach Our Agreement, Network related issues (including emergencies) or you use the Service(s) for improper purposes or for damaging our Network. Where your Service(s) is terminated, the remaining credit balance in your Account will be forfeited. We may from time to time make any changes, including revising the Charges. Changes will be notified via our official website at www.ookyo.com.my. We will assume that you unconditionally accept the changes and wish to continue with Our Service(s), where you continue to use the Service(s) from the date of any such changes. We appreciate any feedback about our Service(s), and are committed to resolving any problems or complaints quickly. If you have any concerns, please contact us via our website www.ookyo.com.my or Ookyo app. You acknowledge that you have been provided with and have read and understood the Agreement in its entirety, and you agree to the terms and conditions of the Agreement. “you” or “your” means the individual, sole proprietorship, partnership, company or entity named in our Registration Form whose application for Services or any part thereof has been accepted and approved by us and who uses or intends to use the Services (including his or its successors and permitted assigns) and anyone appearing to us to be acting with any of the said party’s authority or permission. the Card has not been suspended or terminated. share your information contained in our database with our Related Corporations, corporate shareholders, third parties and/or relevant authorities for the provision of integrated or related services and/or towards the detection and prevention of crime and/or lawful purposes. You confirm and agree that the provision of the Services for any transaction at any time is subject to prior authorisation from the Bank and/or Card Issuer through the supplied terminals or Maxis Pay channels and against an unexpired and valid Card. (d) for any loss or damages whatsoever suffered by you arising from use of the Services. Your primary obligation under the General Terms & Conditions of Service(s) to settle your Maxis official bill statements or on-going recurring purchases made on a periodic basis and to settle the same in a timely manner shall continue and shall not be waived, extended or suspended in any manner whatsoever by the mere approval or agreement from us to provide the Services to the Customer hereunder. Save and except where the fault or delay is clearly attributable to circumstances within our reasonable control, all overdue payments shall be subjected to interest for late payment and/or other consequences as provided under the General Terms & Conditions of Service(s). You confirm that you understand that the Services is applicable for settlement of periodic Maxis official bill statements or on-going recurring purchases made on a periodic basis. All and any other payments outside the periodic Maxis official bill statement cycle or on-going recurring purchases made on a periodic basis shall be promptly settled in accordance with the General Terms & Conditions of Service(s). at our, the Bank’s or the Card Issuer’s discretion. We and/or our Related Corporations shall not be liable for, and you agree to indemnify us and/or our Related Corporations against all claims, losses, liabilities proceedings, demands, costs and expenses (including legal fees) which may result or which we may sustain in connection with or arising from the provision of the Services to you. Notwithstanding any of the foregoing provisions, you agree that the use of the Services is undertaken at your sole risk. You hereby assume all risks arising from the Services or incidental to the use thereof and shall not hold us and/or our Related Corporations liable for any loss arising therefrom. add, delete or amend any of the provisions herein. Notice of any such amendment shall be given to you, and continued use of the Services thereafter by you shall constitute acceptance of the amendments. We may terminate the Services at any time within seven (7) days prior written notice. You may terminate the Services at any time on one (1) month's written notice to us. Notwithstanding the foregoing, the Services shall be automatically terminated with immediate effect without notice to you in the event that the Card is cancelled by the Card Issuer or the Services is terminated by the Bank. The invalidity or unenforceability of any provision herein shall not affect nor prejudice the validity or enforceability of the rest of the provisions. You shall allow an interval of at least fourteen (14) days from receipt by us of the completed registration form for the processing of the application and activation of the Services. We reserve the right at its absolute discretion to approve or reject your application for the Services without assigning any reason whatsoever. You will be notified in the event that your application has been rejected. These terms and conditions shall be read in conjunction with the General Terms & Conditions of Service(s) and Service Specific Terms and Conditions. In the event of any conflict between these Terms and Conditions with the provisions pertaining to the Services in the General Terms & Conditions of Service(s), these terms and conditions shall prevail. PLEASE READ AND UNDERSTAND THE FOLLOWING TERMS AND CONDITIONS WHICH GOVERN YOUR ACCESS AND USE OF THE MAXIS PAY SERVICE (“THE SERVICES”) VIA MOBILE, INTERNET OR ANY OTHER CHANNELS IN WHICH THESE SERVICES MAY BE MADE AVAILABLE BY MAXIS IN THE FUTURE. BY ACCESSING AND USING THE SERVICES, YOU AGREE TO BE BOUND BY THESE TERMS AND CONDITIONS INCLUDING ANY AMENDMENTS MADE THERETO AND ANY OTHER ADDITIONAL OPERATING POLICIES WHICH WE, AT OUR SOLE DISCRETION, MAY IMPOSE FROM TIME TO TIME. IF AT ANY TIME YOU DO NOT ACCEPT ANY OR ALL OF THESE TERMS AND CONDITIONS, YOU MUST IMMEDIATELY DISCONTINUE ALL ACCESS AND USE OF THE SERVICES. WE ALSO RESERVE THE SOLE RIGHT AND DISCRETION TO MAKE ANY AMENDMENTS TO THESE TERMS AND CONDITIONS FROM TIME TO TIME, IN WHICH CASE WE WILL POST THE REVISED TERMS AND CONDITIONS ON OUR WEBSITE AT https://pay.maxis.com.my/. IF YOU CHOOSE TO CONTINUE USING THE SERVICES SUBSEQUENT TO ANY SUCH AMENDMENTS MADE, SUCH USE SHALL CONSTITUTE YOUR AGREEMENT AND BINDING ACCEPTANCE OF ALL AMENDMENTS MADE. The Services provide you with the ability to register for and use a Maxis Pay account which will enable you to make payments for Maxis products and services by: (i) credit/debit/charge cards; and/or (ii) electronic funds transfer via the internet (“Online Banking”) whether through your computer or mobile device or any other channels in which these Services may be made available by Maxis in the future. To make payment for any other products or services as may be introduced by Maxis from time to time. (collectively referred to as “Transactions”). Maxis or its subsidiaries or affiliates may expand the scope of the Transactions from time to time. By using these new Services as they become available, you agree to be bound by these terms and conditions so far as they are applicable. For the avoidance of doubt and notwithstanding anything contained in these terms and conditions, you agree and acknowledge that Maxis reserves the sole right and absolute discretion to limit, cancel or suspend any or all of the Services or available Transactions herein in whole or in part at any time without giving any reason or explanation of the same and without incurring any liability whatsoever to you for doing so. By conducting any Transactions through the Services, you are authorizing payment via Online Banking or Maxis to charge your credit/ debit/charge card or to instruct your bank/ financial institution to obtain the funds on your behalf, accept funds on your behalf, and/or to send the funds to the recipient that you designate. You shall ensure that there are sufficient funds at all times available in your accounts to perform any of your instructions for the Transactions. You may fund your Maxis Pay account using channels and processes authorized by Maxis. No statement of account will be provided by Maxis in respect of the Maxis Pay account. You will be responsible to track and keep records of all of your Transactions using the Maxis Pay account via Maxis’ Customer Call Centre or your credit/debit/charge card or bank account. The use of the Services shall be subject to these terms and conditions (as updated by Maxis from time to time) (“Terms and Conditions”). Your use of the Services will constitute your acceptance of these Terms and Conditions as well as to any inherent risks in conducting any transaction via the Maxis Pay account. These Terms and Conditions shall be in force from the date your application / registration for a Maxis Pay account is approved by Maxis, which will be signified by the availability of the Maxis Pay account to you. Approval of your application for Services shall be at Maxis’ absolute discretion and shall be in force unless terminated in accordance with these Terms and Conditions. Where Maxis has rejected your application, Maxis is not obliged to provide any reason for such rejection or to respond to any request for information. Where applicable, access and use of the Services shall also be subject to our General Terms and Conditions (which include terms and conditions for Website Use, the Fair Usage Policy and the Privacy Statement) and terms and conditions for Postpaid Service and Prepaid Service at www.maxis.com.my and www.ookyo.com.my, which may be updated by Maxis from time to time. To use the Services, you will have to register and open a Maxis Pay account through https://pay.maxis.com.my/. To use the Maxis Pay account, you are required to create a Maxis Pay login credential bearing a username, password, email address, mobile number, identification and PIN. Each time you use your Maxis Pay account to do a Transaction, you will need to authorize and validate the Transaction using the email address and PIN which you had registered with Maxis when you created your Maxis Pay account. to immediately notify Maxis upon receipt of any incomplete, garbled or inaccurate data or information or any data or information which is not intended from Maxis or any doubtful information or message. You agree to delete all such data or information from your mobile phone / device. You are responsible to check and verify Transactions conducted under or via the Maxis Pay account. Maxis shall not be obliged to act on any request to cancel, revoke, reverse or amend any instructions after it has been transmitted to Maxis. In the event that Maxis decides to act upon or carry out any instructions, Maxis shall be allowed such amount of time to act upon and implement any instructions as may be reasonable having regard to the systems and operations of Maxis and any other circumstances then prevailing accordingly. Maxis shall not be responsible or liable for any loss arising from any delay on the part of Maxis in acting upon and carrying out any such instructions. The Maxis Pay account is personal to you and is not transferable and shall be used exclusively by you. The access to any item of the Maxis Pay account through entry of PIN shall be deemed as correct, complete and binding upon you as if such Maxis Pay account had been accessed for each transaction by you. Any instructions sent to Maxis using your user name, email or PIN shall be deemed to have been issued by you and is regular and genuine, notwithstanding that such instructions may have been issued by a third party, either authorized or otherwise, and you shall be bound by such confirmation. You agree that Maxis is not further obliged to check the authenticity of such instructions but Maxis may, at its sole right and discretion, do so for its own purposes. Maxis shall not be responsible or liable for any losses which you may suffer, whether directly or indirectly, as a result of the same. You hereby authorize Maxis to accept and act upon any instructions made by you in respect of Maxis Pay in respect of the Services or to otherwise deal with your Maxis Pay Account without any further authority. Maintaining the confidentiality of the Maxis Pay account Password or PIN is your responsibility and it is up to you not to divulge this information to anyone else. You are responsible for ensuring that you logged off the Services at the end of each session. If you have lost your password or suspect that someone else has obtained your password, it is your responsibility to notify Maxis of this problem immediately. Maxis shall not be responsible for any losses incurred by you as a result of misuse or lost passwords. Anyone caught impersonating any customer, whether an individual or another legal entity, will be responsible for any costs and/or losses incurred as a result of their fraudulent activity. Abusing the Maxis Pay account may result in immediate termination/suspension of the said Maxis Pay account. Maxis reserves the right, from time to time, to request from you additional information in which case you shall provide the information so required failing which the Maxis Pay account may be barred by Maxis at its sole discretion. The use Maxis Pay account is subject to such other applicable terms, conditions, rules and regulations of Bank Negara Malaysia and/or any other regulatory or governmental authority. You agree that payments are not final upon receipt of your instructions. Maxis may at its sole right and absolute discretion, request for additional verification or information prior to the execution of any transfer or payment. Maxis shall not be responsible nor liable for any loss which you may suffer whether directly or indirectly, as a result of Maxis’ failure, neglect, omission or otherwise option not to request for such additional verification and/or information. You agree that Maxis may specify limits on the number of transactions you may make using the Services and the amounts to be so transferred or paid under the same. Maxis shall not be under any duty to ensure punctual payments of any bills or on-going recurring purchases made on a periodic basis by you and neither shall Maxis be under any duty to monitor payment of any bills or to notify any person of the late payment for any bills. Bank / financial institution or government for any applicable charges imposed by the bank/ financial institution or government, in connection with your access and use of the Services. You are advised to check the specific details of the charges involved prior to the registration and use of the Services. You agree and acknowledge that Maxis reserves the right to charge your registered Card on Maxis Pay or debit your Maxis Pay Account for the payment of any fees, charges and/or penalties imposed pursuant to this Agreement including any bank / financial institution or government charges, stamp duties or taxes payable as a result of the use of the Services provided thereunder. Please note that you will be charged for the Services even if it was used by a third party using your mobile device and/or the SIM card registered to you. If the mobile device does not belong to you or if someone else is paying the mobile phone bill; please obtain that person's consent prior to using the Services. You agree to promptly pay all amounts due to Maxis as reflected in your official monthly bill statement and/or for on-going recurring or one-off purchases of Maxis’ products or services and for all charges whatsoever occasioned by the use of the Services irrespective of whether such charges were authorized by you or has arisen from any other causes whatsoever. You warrant and undertake that all information pertaining to your identity and your personal circumstances are true and correct and up-to-date. Maxis shall request for identification to verify the information and reserves the right to request for further validation of information and to reject the request if the information cannot be validated or is found incorrect. You shall promptly notify Maxis in writing of any changes of variations in your personal particulars and Maxis shall be entitled to assume that there have been no changes or variations until Maxis has received notice thereof given by you. You also consent and agree to allow Maxis to make available your name, your MSISDN, email and such other personal information which you provide on registration of the Maxis Pay account to any bank/financial institution solely for the purpose of creation of the Maxis Pay account and to enable Maxis to provide the Services. You agree to indemnify and keep indemnified Maxis and/or any of its subsidiaries or related corporations as defined under the Companies Act, 2016 and its respective employees, agents, officers, and directors from any and all claims, losses, liabilities, cost and expenses (including but not limited to any legal fees) arising directly or indirectly or which may arise out of your instructions to Maxis in use of the Services or breach or violation of these Terms and Conditions or any third party rights or with respect to acceptance, receipt, use or misuse of any product or service as a result of purchases through the Maxis Pay Account and/or the Services or due to the delay and/or failure of the Services. you had misrepresented to Maxis or had submitted false documents or declared false information in relation to the application/ registration of Maxis Pay Account. Any termination of the Services or your use of the Maxis Pay account pursuant to these Terms and Conditions shall be without prejudice to any of Maxis’ other rights and remedies under these Terms and Conditions or at law. The Services and the Maxis Pay account are provided on an “AS IS” basis without any representations or warranties of any kind whether express or implied to the fullest extent permitted by law. You agree and acknowledge that you shall use the Maxis Pay account and the Services at your own risk. Although Maxis will use reasonable endeavours to ensure that the Maxis Pay account is secure and cannot be accessed by unauthorized third parties, Maxis does not warrant the security or confidentiality of any information transmitted through the system/ platform or such other equivalent system in any jurisdiction via Maxis Pay account. It is expressly agreed and declared by all parties hereto that Maxis shall not be liable or responsible to you and/or any other person(s) for any losses, damages, costs or expenses whatsoever suffered by you or such other person(s) arising out of or in connection with the issue, use, withdrawal and/or termination of the Maxis Pay Account resulting from or in consequence of any act or omission by Maxis, except in the case of willful default by Maxis for which such liability shall be limited to the amount of actual loss only. Maxis shall not for any reason whatsoever be liable for any loss or damages suffered by you under any circumstances whatsoever whether or not such circumstances relate to or arise out of these Terms and Conditions including but not limited to non-acceptance for any reasons whatsoever of Maxis Pay account by any person or body, restriction or cancellation of the Maxis Pay account, or under any other circumstances. Maxis, its related and affiliated corporations shall not be liable to you or anyone else for any loss or any direct, indirect, special, exemplary, consequential damages or any other damages whatsoever, including for loss of any revenue or profits, whether in action of contract or tort, arising out of or in connection with your access, use of or inability to use, the Services and the Applications provided under it. Any loss caused by third parties. The Services and the website where the Services is hosted or made available may contain links to third party websites and services that are not owned, controlled by or connected to Maxis and Maxis assumes no responsibility whatsoever for the content, privacy policies and practices of these third party websites and/or services. In addition, Maxis shall also not be responsible for any data/ information, including any of your personal information (such as name, telephone number, age, etc), that you share with anyone through any communication or interaction with any third party in connection with this Service. Please read the terms and conditions of these third parties or third parties’ websites carefully prior to sharing any such information. You agree and acknowledge not to dispute the validity, accuracy or authenticity of any evidence of your instructions and/or communications transmitted between Maxis and you, including but not limited to any evidence in the form of Maxis’ computer records which may take the form of, among others, telephone logs, transaction logs, magnetic tapes, cartridges, computer printouts of any communication and any other form of information and data storage, all of which having been produced by Maxis’ computers in the course of their ordinary use. You further agree and acknowledge that parties shall refer and at all times, treat all of the said computer records of Maxis therein as conclusive evidence of your instructions and/or communications received or sent by Maxis. Notwithstanding anything contained in this Agreement, you agree and acknowledge that all your said instructions and/or communications which are sent to Maxis and meet the operating standards and requirements of Maxis shall be deemed to be as good as, and given the same effect as, written and/or signed documentary communications. You agree that the failure of Maxis, whether continuous or otherwise, to exercise any rights, power, privileges, remedies or provisions of these Terms and Conditions or Maxis’ failure or delay to insist on compliance with any of these clauses shall not constitute a waiver by Maxis of any such rights, power, privileges, remedies or provisions of these Terms and Conditions. The Agreement shall be governed by and construed in accordance with the laws of Malaysia, excluding its conflict of law rules. Parties agree to submit to the exclusive jurisdiction of the Malaysian courts. Where any claims, proceedings, actions, suits or disputes arising or in connection with this Agreement is to be commenced or adjudicated in the High Court of Malaya, the parties agree that it shall be adjudicated in the High Court in Kuala Lumpur, Malaysia. Any conflict or inconsistency between this SSTC, GTC, the Terms & Conditions for Direct Debit Services and Maxis Pay Terms and Conditions, the terms and conditions shall be construed in the following order of precedence: (a) SSTC; (b) Terms & Conditions for Direct Debit Services or Maxis Pay Terms and Conditions; and (c) GTC. We reserve the rights without liability, to revise this SSTC, the Ookyo Plan and our pricing. Where reasonably practicable, we will give you reasonable advance notice of such changes and all previous versions of our user guides or leaflets will be superseded. You accept you are responsible for regularly reviewing information on the Ookyo Plan and Service(s) at the Ookyo Website(Ookyo.com.my) or via the Ookyo App for any updates, revisions or changes including changes to the Agreement. Your continued use of the Service(s) and/or the Ookyo Plan (after the Effective Date of any revision/change to the terms and conditions of the Agreement, Service(s) and/or the Ookyo Plan) shall constitute unconditional acceptance by you of such revisions/changes and you shall be bound by the same. If you do not accept such revisions/changes, you may discontinue using the Ookyo Plan and/or the Service(s), failing which you are assumed to have accepted the changes. In order to use the Ookyo Plan, Service(s) and/or Subscription(s), you must first install and run the Ookyo App on your Mobile Phone or Mobile Device. The Ookyo App can only be installed and run on Android enabled devices. Please check your Mobile Phone or Mobile Device handbook or consult the maker of your Mobile Phone or Mobile Device. We are not liable if you are unable to use the Ookyo Plan and/or the Service(s) as a result of the make, model or functionality limitations of your Mobile Phone or Mobile Device. You remain solely responsible to ensure the Mobile Phone or Mobile Device used by you is compatible for use of the Ookyo Plan and/or the Service(s). There will not be any refund of payment made if you are unable to use or view the Service(s) purchased or subscribed to in accordance with this SSTC. The Ookyo Plan is a prepaid product. It consists of 4 customizable Unlimited Apps, 8 GB of Mobile Internet Data and 500MB of Free Basic Internet. Provides zero-rated mobile data usage on a customizable group of 4 different mobile apps. Zero-rated means your mobile internet quota is unlimited in relation to your use of the apps under the defined group of apps unless specified otherwise and such use is always subject to the Fair Usage Policy. Any Peer-to-Peer (P2P) sharing, Internet tethering and use of VoIP services (except if the VoIP service is provided in an App under your selection of Unlimited Apps) will draw down from your 8 GB of Mobile Internet Data. You may select any 4 apps listed under the Unlimited Apps. You must fill up all 4 Unlimited App slots. You are not allowed to select the same app for different app slots. You can change your selection of Unlimited Apps via the Ookyo App until 25 hours before your Ookyo Plan renews. You are not allowed to make any changes to your selection of Unlimited Apps when you are in Grace Period. If you did not make any changes to your selection of Unlimited Apps, the current selection will continue for your next Active Period. Changes will be effective upon the next successful renewal of the Ookyo Plan. You will be requested to re-select your preferred Unlimited Apps each time after you make a manual payment. You will not be allowed to make changes to your selection of preferred Unlimited Apps during your 30 days Active Period. You can only change your selection of Unlimited Apps via the Ookyo App upon payment. You can refer to the Ookyo Website (ookyo.com.my) or the Ookyo App for the latest list of groups of apps and/or apps applicable for the selection of your Unlimited Apps. The 8GB of Mobile Internet Data and 500MB of Free Basic Internet provides mobile internet quota for all browsing purposes applicable to all Maxis networks including 2G/3G/4G LTE. Refers to internet at reduced speed limited to a maximum of 64kbps. This service is subject to a monthly Fair Usage Policy (FUP) of 500MB. Upon exhaustion of the FUP quota, Free Basic Internet services will be disconnected. You are required to complete a first time registration at our Ookyo Website or Ookyo App. Your registration details must match the details on your identification you are using to register. You are solely responsible for providing correct and accurate registration details. Failure to do so may result in the rejection of your registration and delivery of your SIM Card, and forfeit of any payments we have received from you for the Ookyo Plan, which shall be non-refundable. The pricing of the Ookyo Plan (including any changes) are set out in the Ookyo Website and Ookyo App. Charges displayed do not include all applicable taxes and GST. Port in from other local operators. All existing Hotlink customers of any plan can migrate to the Ookyo Plan except for, Hotlink Tablet and Broadband Plan. Your Account lifecycle Active Period will be replaced with 30 active days at the point of successful migration to and activation of the Ookyo Plan, and the Grace Period will reset to 50 days. All existing subscriptions and purchases (e.g. : Mobile Internet Passes, Hot Tickets, RED Points etc.) on Hotlink Plan will not be retained after migration. They are not applicable to the Ookyo Plan. Any credit balance will be carried over to the Ookyo Plan into your Ookyo Wallet. Validity of the credit balance will follow the Ookyo Plan. All existing Maxis Postpaid customers of any plan can migrate to the Ookyo Plan by switching to a Hotlink Plan first before switching to the Ookyo Plan, after which clause 4 shall apply. Before migration, you are responsible to ensure that the Maxis Postpaid plan is registered in your name and you have cleared all outstanding bills. All existing subscriptions and purchases (e.g. : Mobile Internet Passes) on Maxis Postpaid plan will not be retained after migration. They are not applicable to the Ookyo Plan. All existing Ookyo customers can migrate to any Maxis Postpaid plans. Before migration, you are responsible to ensure that you cancel your Ookyo Plan first before submitting a port-out request. Failure to do so may result in the recurring charges being charged to your registered Card, which is non-refundable. All existing Ookyo customers can migrate to a Hotlink Plan, subject to Hotlink’s terms and conditions. In order to migrate to a Hotlink Plan, you will need to first migrate to a Maxis Postpaid Plan, after which, you will be able to submit a request to Maxis to migrate to a Hotlink Plan. All Ookyo users will be automatically migrated to Ookyo Unlimited Apps on 21st May 2018 (“Unlimited Apps Migration Date”) and will be required to choose 4 Unlimited Apps for their Unlimited Apps service to continue. For “Automatic Renewal” users, you can choose to migrate to Ookyo Unlimited Apps prior to the Unlimited Apps Migration Date by choosing your 4 Unlimited Apps via the Ookyo App for your next cycle. For “No Automatic Renewal” users, you can choose to migrate to Ookyo Unlimited Apps prior to the Unlimited Apps Migration Date if you change your payment type to “Automatic Renewal” and choose your 4 Unlimited Apps via the Ookyo App for your next cycle. If by the Unlimited Apps Migration Date you do not choose 4 Unlimited Apps to fill up the customizable slots, all apps data usage will draw down from your Mobile Internet Data or Free Basic Internet. Payment for the Ookyo Plan can be made via Maxis Pay using your Card or Online Banking. No Automatic Renewal – pay via Maxis Pay using your Card or Online Banking. If you select Automatic Renewal, you authorise us to auto-charge the registered Card for recurring renewal of the Service(s) before the expiry of each periodic Active Period. If you do not select Automatic Renewal, you must manually make payment in order to renew the Service(s) for the next Active Period via Maxis Pay using your Card or Online Banking. It is your responsibility to pay for the renewal of your Ookyo Plan, failing which your Ookyo Plan will transition to a grace status and the conditions in clause 9 will apply. If you do not select Automatic Renewal, you have an option to perform Advance Payment for the Ookyo Plan. Advance Payment allows you to pay for the Ookyo Plan for your next immediate Active Period, at any time during the 30 days of your current Active Period to avoid any service disruption. If your Advance Payment is successful, the Ookyo Plan will renew immediately after your current Active Period ends and such Advance Payment is non-refundable. You can only perform one (1) Advance Payment during each Active Period. You are required to register and maintain at least one (1) Card on Maxis Pay if you opt for the Automatic Renewal. If the Mobile Phone, Mobile Equipment or Mobile Device does not belong to you or if someone else is paying for the Charges, please obtain that person's consent before registering for the Service(s). Your payment of the Charge will need to be successful in order for us to process your registration of the Ookyo Plan and/or activate and/or renew the Service(s). Share your information contained in our database with ourRelated Corporations, corporate shareholders, third parties and/or relevant authorities for the provision of integrated or related services and/or towards the detection and prevention of crime and/or lawful purposes. If we are unable to or delay in providing the Maxis Payand/or Direct Debit services for circumstances beyond our reasonable control (e.g. power failure). At our, the Bank'sor the Card Issuer's discretion. We may introduce other modes of billing from time to time by giving you prior notice. You are allowed to change your payment mode from “No Automatic Renewal” to “Automatic Renewal”. Upon successful change of payment mode to Automatic Renewal, you will be charged automatically for every subsequent renewal cycle. For users who register for the Ookyo Plan we may require to deliver a new SIM Card to you. Upon delivery of the SIM Card, we or our third party delivery services have the right to request and validate your identification card with the registration details for the Ookyo Plan. If your identification does not match the registration details for the the Ookyo Plan, we or our third party delivery services have the right to reject the delivery. If you registered for a new mobile number, a new SIM Card will be delivered to you. Upon successful delivery, you are required to self-activate your SIM Card via the Ookyo App otherwise your SIM Card will be automatically activated when your delivery status changes to ‘Delivered’. If you are migrating from an existing Hotlink Plan to the Ookyo Plan, a new SIM Card will not be required. The Service(s) will be activated on your existing Hotlink SIM Card. If you are migrating from an existing Maxis Postpaid plan to the Ookyo Plan, a new SIM Card will be delivered to you. Upon successful delivery, we will process your request to migrate. Upon successful migration, we will activate your SIM Card. If you are porting in from another local operator, a new SIM Card will be delivered to you with a temporary mobile number. Upon successful delivery, you are required to self-activate your SIM Card via the Ookyo App otherwise your SIM Card will be automatically activated when your delivery status changes to ‘Delivered’. We will then submit your porting request and upon successful porting, your existing mobile number will be mapped onto the new SIM Card which was delivered to you and the temporary mobile number will be cancelled. Any Service(s) you had purchased on the temporary mobile number will be maintained. If the porting is unsuccessful, the Service(s) will continue on the temporary mobile number. You have the option to retry porting by submitting this request via the Ookyo Website or Ookyo App. The Ookyo Plan has an Active Period of 30 days. Your Account uotah you’reeu’vegain. Eg: You’ast your eye over this to ensure that ating to a service. I don;t shall commence upon the successful activation of the SIM Card for the duration of the Active Period. Upon successful activation of the SIM Card, you will be requested to select your 4 Unlimited Apps before proceeding. You must maintain your Account for each and every Active Period consecutively otherwise your Accountwill be terminated and the conditions in clause 10 will apply. You will then have to purchase a new Ookyo Plan to access the Service(s). We will attempt to charge your registered Card one (1) day before the expiry of each Active Period, in order to renew the Service(s) for the next Active Period if you chose Automatic Renewal at the time of registration of your Ookyo Plan. If the charge is successful, the Active Period will be renewed for another 30 days, which shall commence on the date immediately after the expiry date of the previous Active Period. Your 5GB of Mobile Internet data and 500MB of Free Basic Internet will be replenished. Any requests to make changes under the Unlimited Apps will take effect immediately. Balances in your Ookyo Wallet and Google Play Rewards Wallet will be brought forward. If the charge is unsuccessful, your Ookyo Plan will transition to a grace status and you will be given a Grace Period of fifty (50) days from the expiry date of the relevant Active Period, for a successful payment to be made. If successful payment is made during the Grace Period, your Active Period will resume from the date that successful payment is made. If no successful payment is made during the Grace Period, the Service(s) will be immediately terminated and the conditions in clause 5.10 will apply. Purchase and use of any Subscription(s). any airtime balance under your Ookyo Plan. The Service(s) and add-on Subscription(s) are available via the Ookyo App to users with an Active Account status. A charge will need to be successful for each purchase for the activation and use of any of the Service(s) and Subscription(s). Any revised pricing of the Unlimited Add On, Pop Deal and additional Subscription(s) will be reflected in the Ookyo App. We may, at any time vary, change, add or remove any Subscription. Your access to or usage of the Subscription purchased prior to any variation, change, addition or removal of such Subscription will not be affected during your Active Period. Ookyo Wallet is used to purchase service(s) available to registered users. e.g. : Unlimited Add On, Pop Deal, Internet Add On, Voice & SMS, Unlimited Calls and tariffs. You can hold a maximum amount of RM1000 of credit in the Ookyo Wallet at any time. Share-a-top-up and Ask-a-top-up allows you to request for credit transfer from other Ookyo and Hotlink users. Service charge for transfer may apply. Validity of credit in the Ookyo Wallet follows your Ookyo Plan. Hotlink top-up validity rules do not apply to credit topped-up or transferred into the Ookyo Wallet. During the Active Period, you are able to use the credit. During Grace Period, use of credit is suspended. For purchases made in the Ookyo App, you are rewarded a percentage of your purchase amount, which shall be credited into your Google Play Rewards Wallet. Purchases of the following are eligible for Google Play Rewards credit: the Ookyo Plan, Unlimited Add On, Pop Deal, Internet Add On, Voice & SMS and Unlimited Calls. Validity of the credit in your Google Play Rewards Wallet follows your Ookyo Plan. Ookyo credit and Google Play Rewards credit can be used in combination to make a purchase in the Google PlayTM Credit drawdown precedence is in order of Google Play Rewards credit followed by Ookyo credit. Unlimited Add On provides zero-rated mobile data usage on defined app(s)(“Standalone”) or a defined group of apps (“Bundle”). You can refer to the Ookyo Website (ookyo.com.my) or the Ookyo App for the latest list of Standalone apps or Bundle of apps applicable for your selection under Unlimited Add On. Validity follows your Ookyo Plan unless specified otherwise. Quota is unlimited unless specified otherwise and is subject to Fair Usage Policy. Payment for Unlimited Add On will be deducted from your Ookyo Wallet. Purchase of Unlimited Add On is eligible for Google Play Rewards. We may at any time vary, change, add or remove any Standalone apps, Bundles or apps within a Bundle applicable for the Unlimited Add On service (“Unlimited Add On Variations”). Your access to or usage of the Standalone or Bundle purchased prior to any Unlimited Add On Variations during your Active Period will not be affected. Pop Deal is a promotional offer that we provide every day via the Ookyo App. When a Pop Deal is announced, you have 24 hours to purchase it. Validity follows as specified in the product description. Your Account need to be in Active state to use the Pop Deal. Quota is as specified in the product description and is subject to Fair Usage Policy. Payment for Pop Deal will be deducted from your Ookyo Wallet. Purchase of Pop Deal is eligible for Google Play Rewards. Internet Add On provides mobile internet quota for all browsing purposes applicable to all Maxis networks including 2G/3G/4G LTE. Internet Add On is stackable and you may purchase multiple passes. Whichever of the Internet Add On expires first shall have its quota entitlement exhausted first. Validity of Internet Add On follows as specified in the product description. Your Account needs to be in Active state to use the Internet Add On. Payment for Internet Add On will be deducted from your Ookyo Wallet. Purchase of Internet Add On is eligible for Google Play Rewards. Voice & SMS provides a bundle of Unlimited minutes and Unlimited SMS for all local networks. Voice calls made using the allocated minutes will follow a 30-sec charging block. Voice & SMS is stackable and you may purchase multiple passes. Voice & SMS is valid for 30 days upon purchase. It is not impacted by the validity of your Ookyo Plan. Payment for Voice & SMS will be deducted from your Ookyo Wallet. Purchase of Voice & SMS is eligible for Google Play Rewards. Voice & SMS is no longer available on the Ookyo store as of 3rd April 2019. The last date of usage for Voice & SMS is on 3rd May 2019. Unlimited Calls provides a bundle of Unlimited minutes for all local networks. Unlimited Calls is stackable and you may purchase multiple passes. Unlimited Calls is valid for 30 days upon purchase. It is not impacted by the validity of your Ookyo Plan. Payment for Unlimited Calls will be deducted from your Ookyo Wallet. Purchase of Unlimited Calls is eligible for Google Play Rewards. The rates outlined for the Service do not account for usages while on an overseas roaming network. Whilst roaming overseas, the Hotlink prevailing data roaming charges apply. You need a minimum credit balance of RM10 in your Ookyo Wallet to roam. Data Roaming Passes can be purchased via *100# when roaming. Voice Roaming charges follow Hotlink. Invite Member is a referral campaign where you are rewarded Google Play Rewards credit for referring friends. You need to maintain an Active Account. You have 1 active referral; you will not receive another one-off RM 5 reward. You have 2 active referrals; you will not receive another one-off RM 5 reward. You have 3 active referrals, you will receive the second of four RM 5 reward. You reduce to 2 active referrals, we will pause the second of four RM 5 reward. You have 5 active referrals, you will receive final of four RM 5 reward and first of ten RM 10 reward. Invite Member ends after you have received all eligible rewards payouts. Use of apps covered in the Unlimited Apps, Unlimited Add On(s) and Pop Deal will be zero-rated if the Ookyo App is running on your Mobile Device, which you are using for the Service(s). g. The Unlimited Apps, Unlimited Add On and Pop Deal only covers App A. If you use App A, any mobile data usage on this app will be zero-rated. Use of apps covered in the Unlimited Apps, Unlimited Add On(s) and Pop Deal will not be zero-rated if the Ookyo App is not running on the Mobile Device which you are using the Service(s) Instead, it will consume data from any available Internet Add On quota. For the Unlimited Apps, Unlimited Add On(s) and Pop Deal, whichever of them expires first shall have its quota entitlement exhausted first. 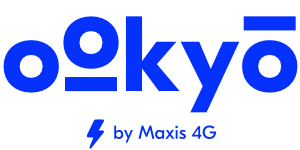 The Ookyo App Service ("Ookyo App") is brought to you by Maxis Broadband Sdn Bhd ("Maxis") and provided to you subject to the terms and conditions set out herein. You acknowledge and agree that you have read and fully understood all these terms and conditions. Ookyo App is a self-serve application whereby it allows you to access your Ookyo general account information such as account profile, purchases, etc., through your mobile device & is provided subject to Ookyo terms & conditions. These features may be changed by Maxis from time to time and as updated in the Ookyo App. Please refer to the Ookyo website (www.ookyo.com.my) for the latest version of Ookyo' terms and conditions. By accessing the Ookyo App, you agree to be bound by these Ookyo App terms & conditions (which may be amended from time to time) and the Ookyo terms and conditions as mentioned above. To enable us to provide Ookyo App to you, we will need to process and use your personal information/personal data. You expressly authorize and consent that Maxis may process and use your personal information/personal data for purposes necessary and related to Maxis’ provision of Ookyo App services to you. Further details of Maxis’ use and processing of your personal information/personal data is in accordance with Maxis’ Privacy Statement at http://www.maxis.com.my/en/privacy-statement.html which shall form an integral part of these Ookyo App terms and conditions. You shall update Maxis as and when your personal information/personal data provided earlier to Maxis becomes incorrect or out of date, through our customer service channels as set out in Maxis Privacy Statement. "personal information"/"personal data" includes your information collected from you which is required for purposes of applying and registering for and provision of the Ookyo App to you, including but not limited to, any sensitive personal data and expression of opinion(s) about you. Not all mobile devices support the Ookyo App. You should check whether your mobile device is compatible before using the OokyoApp. Certain features of the Ookyo App may require the input of your email address/online ID or password registered in order to access or use the Ookyo App. You are solely responsible for the security, confidentiality & privacy of your email address/online ID, password & any data or information stored on your mobile device and/or for all the activities related to the Ookyo App. Maxis will not be liable for any damage, loss or leakage of the data or information resulting from unauthorized use of the Ookyo App or due to circumstances beyond Maxis’ control. You agree that all information you provide to Maxis to access the Ookyo App ("Registration Data") will be true, accurate, complete and current information and that you shall maintain and update the Registration Data as needed throughout the period of your use of the Ookyo App to keep it accurate and current. Failure to provide accurate, current and complete Registration Data may result in the suspension and/or termination of your access to the Ookyo App. Certain features of the Ookyo App may require access to location services such as the cellular network & data connection in order to determine an approximate location of your mobile device. You may exercise choices in respect of the features of Ookyo App as contained in the settings of Ookyo App. Kindly refer to those features on your mobile application. Any data retrieval or re-direction to other websites from the OokyoApp will incur mobile data charges. If you use the Ookyo App overseas, additional roaming & mobile data charges will apply. You expressly understand & agree that your use of the OokyoApp is at your own risk & that the Ookyo App is provided on an "AS IS" & "AS AVAILABLE" basis & we expressly disclaim all warranties of any kind, whether express or implied, including, but not limited to fitness for a particular purpose & non-infringement and/or that the Ookyo App will be free from loss, corruption, attack, viruses, interference, hacking or other security intrusion or that the Ookyo App will be affected by unforeseen circumstances or circumstances beyond Maxis’ control. Maxis, its related and affiliated corporations shall not be liable to you or your agents for any loss or injury or any direct, indirect, special, exemplary, consequential damages, or any damages whatsoever, whether in contract, negligence or in tort, you and/or any third party may suffer as a result of instructions or transactions transmitted via the Ookyo App after successful authentication whether or not such usage was authorised by you and/or arising out of or in connection with the Ookyo App and/or your or any other party's access and/or use of the Ookyo App. your violation of any rights of another through your usage of the Ookyo App. Maxis may update or change these Ookyo App terms & conditions on the Ookyo website from time to time. You are responsible for regularly reviewing the current version of the terms and conditions for the Ookyo App and Ookyo website to obtain notice of any such changes. Your continued access into and usage of the Ookyo App shall be construed as you having accepted all such changes. All matters & disputes will be subject to our final decision. *All terms in BOLD are defined at the Definition section located at the end of this document. you will not use the Servicesto transmit "junk mail", "spam", "chain letters", or unsolicited mass distribution of email, or for any commercial purposes. you will not use the Servicesto impersonate any other person or to create a false identity. you will not develop restricted password-only access pages, or hidden pages or images (those not linked to or from another accessible page). you will notify Maxis immediately of any unauthorised use or any other breach of security. You will not engage in any activity, whether lawful or unlawful, which we solely determine, to be harmful to our customers, operations, reputation, good will or customers relation. You will not disrupt or undermine the security of the various networks and systems that are connected to the Services, or violate the regulations, policies, or procedures of such networks or systems. This may include any failure to update software use on your account or website that is known to be vulnerable to malicious activity or exploitation. The Servicesinvolves access to, use of and exchange of information over the internet and you acknowledge that such access to, use of and exchange of information may not be secure. Maxis will not be liable to you if you suffer loss or damage as a result of the information not being secure. You hereby agree that Maxis merely facilitates the Services for you to send multimedia messages and does not expressly or impliedly endorse, authorise or sponsor the messages sent by you. You hereby release Maxis from any liability, disputes, claims, demands and/or damages of any kind arising from or in any way connected to the use of the Services. Maxis may refuse, remove, modify or deny access to any Content, products or services which you transmit or make available via the Servicesor on any website, including without limitation such Content, products or services that may be or are alleged to be defamatory, offensive, indecent, objectionable or illegal or may have infringed any party's intellectual property rights. We shall not be responsible for determining the validity of any allegations in this regard. Maxis is not responsible for the condition or Contentof any third party sites which may be found on the Services. The link(s) are provided solely for your convenience and do not indicate, expressly or impliedly, any endorsement, authorization or sponsorship by Maxis of those site(s) or the products or services provided there. You access those sites and use their products and services solely at your own risk. Maxis is not responsible for use or any transactions performed on those sites. Maxis may deny access to or remove any third party Content, products or services that may be defamatory, offensive, indecent, objectionable or illegal or may have infringed any party's intellectual property rights, without notice to you. Without prejudice to paragraph 3.3 above, Maxis may refuse, remove, modify, deny access to, suspend or terminate any third party Content, products or services which you may access, use or acquire via the websites, Services. Maxis and its Related Corporations will not be liable to you or any third party under this Clause 3. Maxis does not guarantee that you will have access to the Servicesat all times. You may experience interruptions to the Services and Maxis will not be liable to you if you suffer loss or damage as a result of these interruptions. You access that Content and use their products and services solely at your own risk. In no event will Maxis be liable to you or anyone for any damage arising from or occasioned by the use of these third party Content. If you post Contentor submit material, unless we indicate otherwise, you grant Maxis a non-exclusive, royalty free, perpetual, irrevocable, fully sub-licensable right to use, reproduce, modify, adapt, publish, translate, create derivative works from, distribute, and display such content throughout the world in any media. You grant Maxis and sub-licensees the right to use the name that you submit in connection with such Content. You represent and warrant that you own or otherwise control all the rights to the Contentthat you post; that the Content is accurate; that the use of the Content you supply does not violate the Maxis Fair Usage Policy and will not cause injury to any person or entity. Maxis may establish general practices and limits concerning use of this Services, including without limitation, the maximum number of times (and the maximum duration for which) you may access the Services, in a given period of time. Maxis reserves the right to investigate potential abuses and/or any abuse pursuant to your use of the You are required to fully cooperate with any of Maxis’ investigations in respect of these matters. The Contentin the Services are protected by copyright, trademarks and/or other intellectual property rights and other relevant laws of Malaysia. You may view the Services and use its Content for personal and non-commercial purposes. Any Content on the Services may not be reproduced, distributed, transmitted, published, displayed, broadcasted, stored, adapted, licensed, altered, hyperlinked or otherwise used in any manner or by any means without Maxis’ prior written consent. You may not, without Maxis’ prior written consent, insert a hyperlink to the Services (or any part thereof) on any other website. You may not frame or utilise framing techniques to enclose any Content, trademark, logo, or other proprietary information (including images, text, page, layout, or form) of Maxis without express consent. You may not use any meta tags or any other "hidden text" utilising names, logos or trademarks belonging to Maxis without express consent of Maxis. No license or rights are granted to you and your access or use of the Servicesshould not be construed as granting, by implication, estoppel or otherwise, any license or right to use the trademarks, trade names, logos, or service marks without Maxis’ prior written consent. The compilation (including but not limited to the collection, arrangement, and assembly) of all Contenton the Services is the exclusive property of Maxis and protected by copyright. All software used on the Services is the property of Maxis or its software suppliers and protected by copyright. Maxis reserves the rights to restrict, suspend or terminate your account or your access to the Services. Maxis shall not be liable for any failure to perform its obligations herein caused by acts of God, insurrection, war, act of terrorism, national or local emergencies, requirements of government or other competent authorities, industrial disputes of any kind, fire, lightning, explosions, flood, inclement weather, subsidence, acts or omissions of third party, third party suppliers, operators, service providers, contractors or agents whom we may use to perform any part of the Service(s), computer software malfunction, electrical power failure and/or interruption or disruption of Maxis’ network or any cause outside Maxis’ reasonable control. Maxis reserves the right to modify for any reason whatsoever or suspend or terminate (temporarily or permanently) the Servicesat any time and from time to time with or without notice. You agree that Maxis shall not be liable to you or to any other party for such modification, suspension or termination of the Services. Any breach or attempted breach to compromise Maxis’ and/or any other party’s network security is prohibited and may result in criminal and/or civil liability. We are committed to safeguarding your privacy online. We have taken steps to ensure that reasonable measures have been put in place to prevent unauthorised access, disclosures, loss or thefts of personally identifiable information collected and transmitted through the Services. You may be required to register and provide personal details in order to access certain Online Services. In such circumstances, you may be required to enter your password every time you access the Online Services. You are responsible for maintaining the confidentiality of your password and/or user authentication and for restricting access to your computer, and you agree to accept responsibility and liabilities for all activities that occur under your password and/or user authentication, whether authorised by you or not. You undertake to observe all security measures prescribed by Maxis concerning your password or generally in respect of the access and use of the Services. Should you have any reason to believe that your password has been misused and/or compromised whether by theft, fraud or otherwise, you shall inform Maxis immediately after becoming aware of the same and you will proceed to change your password. Maxis shall not be liable for any loss or damage which you and/or any third party suffers or may suffer as a result of instructions or transactions transmitted via the Servicesafter successful usage of your password whether or not such usage was authorized by you. You shall keep Maxis fully indemnified against all loss or damage which Maxis suffers or may suffer in connection, whether directly or indirectly, with usage of your password whether by you or any third party, authorized or otherwise. Maxis reserves the right to invalidate or suspend your password at any time without being obliged to offer you any explanation or prior notice. Maxis shall not be liable for any loss or damage which you may suffer as a result of such invalidation and/or suspension. Maxis reserves the right to discontinue the password accessing system with respect to the Servicesat any time, without prior notice. Maxis shall not be liable for any loss or damage which you may suffer as a result of such discontinuation. Notwithstanding anything to the contrary herein contained, Maxis and our respective personnel and/or suppliers will not be liable to you or any other party in contract, tort (including negligence ) or otherwise in respect of any claim brought by you or by any third party for any loss of profit or revenue or loss of business or loss of data or for interrupted or suspended communications or for any direct, indirect, special, incidental, consequential damages, punitive damages, or for any injury caused or suffered by a person or damage to property or any damages arising out of or in connection with the Services, whether or not Maxis, our personnel or suppliers were or should have been aware of the possibility that such damage or loss would occur. The exclusion referred to herein applies to any action giving rise to an obligation, duty or liability. We disclaim any and all liability to the fullest extent allowed by law. Without prejudice to the foregoing, where a court or an arbitrator holds or finds Maxis and our respective personnel and/or suppliers liable to you for any breach or default,you agree that the amount of damages payable by Maxis and our respective personnel and/or suppliers to you will not at any time exceed the sum of RM500.00. To the full extent permitted by law, Maxis disclaims any and all such warranties. if sent by fax, upon notification that the message was successfully transmitted in its entirety; and if sent by email, on the date the email was recorded as sent in the e-mail. cease to utilize the Servicesor any part thereof for such period as may be required by Maxis. not use the Servicesto cause embarrassment, distress, annoyance, irritation or nuisance to any person. at all times keep the personal identification and password created confidential and not release the password to any person. Content(s)means certain information including but not limited to text, sounds, music, software, photographs, videos, data, graphics, images, logos, button icons, audio clips, messages, links, listings or other materials placed on the Services. Maxis refers to Maxis Mobile Services Sdn Bhd (Co. No. :73315-V) and/or Maxis Broadband Sdn Bhd (Co. No. :234053-D), company incorporated in Malaysia under the Companies Act, 2016 having its registered address at Level 21, Menara Maxis, Kuala Lumpur City Centre, off Jalan Ampang, 50088 Kuala Lumpur, Malaysia and/or its Related Corporations, as may be applicable, and includes their successors, assigns, employees and agents. Online Servicesmeans any functions, features, access to and use of the internet, internet information and/or other services, various service and communication channels and facilities through the internet, or communication facilities or services made available by Maxis from time to time subscribed or to be subscribed by you in connection with the Online Services, through the Services, which includes but is not limited to, online transactions, messaging services, single sign on, online transactions, search engines, automated services, e-commerce facilitators, chat, discussion groups and/or e-mails; and any products and/or services offered by Maxis. The list of Online Services may be updated and amended by Maxis from time to time, in respect of which you shall be bound to this Term of Use for access to and usage of the new Online Services. Related Corporationsmeans the related corporations as defined under the Companies Act, 2016. Servicesincludes Ookyo’ Website and/or Online Services. Websitemeans the Ookyo website (ookyo.com.my), Maxis’ website (www.maxis.com.my) and/or such other Maxis’ website, which is subject to change from time to time. You and Yourrefers to the person or entity accessing and using the Services. Your continued use of the Service(s), the Ookyo Plan and/or Promo (after the Effective Date of any revision/change to the terms and conditions of the Service(s), the Ookyo Plan and/or Promo) shall constitute an acceptance by you of those changes and you shall be bound by the same. If you do not accept such revisions/changes, you may discontinue using the Service(s) and/or the Ookyo Plan, failing which you are assumed to have accepted the changes. All users of the Ookyo Plan who has successfully registered or renewed the Ookyo Plan within the Campaign Period are eligible for the promotional rewards listed in the Table under clause 12 (“Promotional Rewards”). You received an email notification regarding successful payment and your order confirmation. The Promotional Rewards amount will only be applicable for successful registrations or renewals during the Campaign Period. This means that for any successful registrations or renewals after the Campaign Period End Date, the rewards amount will default back to the original applicable rewards as listed in the Ookyo Website (ookyo.com.my). In the Ookyo App resides an Internet Quota Balance indicator. Upon successful registration or renewal of your Ookyo Plan during the Campaign Period, you will see on your Internet Quota Balance indicator, a Mobile Internet Data balance equivalent to the Promotional Rewards you are entitled to receive. Upsized 8GB of Mobile Internet Data after successful registration or renewal. In order to participate in the Promo, you will need to successfully purchase the Ookyo Plan and register as a user via the Ookyo Website or Ookyo App. Your registration must include referral codes WJHOZ7, O6UYXF or H9YWHE. All first-time users of the Ookyo Plan who has successfully registered within the Campaign Period are eligible for the promotional rewards listed in the Table under clause 12 (“Promotional Rewards”). The Promotional Rewards payout amount will only be applicable for successful registrations during the Campaign Period. This means that for any successful registrations after the Campaign Period End Date, the rewards payout amount will default back to the original applicable rewards as listed in the Ookyo Website (www.ookyo.com.my). you have downloaded the Ookyo App. Free RM10 Google Play Credit rewards after successful registration. · Registration must include referral codes WJHOZ7, O6UYXF, or H9YWHE.